Greetings from Vancouver Canada,just bought this gorgeous knive love it and your review. Best wishes from S Florida! Great site. Just found you today and have enjoyed watching your reviews of a few of the knives that I am currently considering for my next purchase. I have been looking at the Benchmade knives and am leaning towards something with a little larger handle than the Spyderco Native that I am currently carrying (XL hands) and so was really interested to watch our reviews of both the BM Griptillian and the BM Rift. Price aside for the moment, would you select one over the other based on your experience with them? First of all, welcome to the site! I am so happy to hear you have been enjoying yourself. To get to your question, well, that is a tough question. The way I see it the Rift is a larger and much heavier knife. Since you are a big guy you may like that. 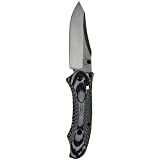 But if you are looking for a good size knife that is lightweight the Griptilian is a very nice knife. It’s nothing fancy, but it has stood the test of time for me. If we are talking regular EDC I would tend to prefer the Griptilian because I find it more practical. For harder use / cool factor then I’d go with the Rift. So my question for you is, do you prefer a more solid heavy knife or do you like something that is lightweight? Is this something to be carried daily in an urban / suburban work environment or is it going to be used on the weekends or for a more physical / outdoor job? Either way I do think they are both nice knives. great review. definately an awesome blade. it doesnt carry like a heavy knife and i dont realise its there sometimes. the g10 is textured very well. it grips good but doesnt chew up the pockets. Thank you, Josh! Enjoy your Rift! You have a grate web site! 1. Have you seen people drill out the inner handle to drop weight? 2. I cant decide between the bare blade or black, This knife (if bought) would be a more of going out knife, maybe a EDC later down the road. How does the black blade hold up agents use and the hands of time ? 1. No. I think part of the problem you may run into is I believe that the liners are hardened. They will be really tough to drill through without the proper tools. 2. Personally if I buy a knife with any kind of coating on it, I expect that the coating will wear. I know Benchmade’s black coating is “pretty good” but I do expect it to wear over time. Personally, I have never owned a coated Benchmade so this is all second hand information. I’m really passionate about the Rift and don’t understand the lack of attention and even negative comments. I feel that I have to defend it. It’s one of my favorite knives. The main complaints I read are lack of any jimping, non milled liners, the handle, and blade steel. Sounds like a lot but mainly nonsense. I agree, it could use some good jimping on the thumb ramp area. However, the more I know about knives, the more I realize jimping is mostly overrated. A lot of it just gives a false sense of security. On a properly designed knife, jimping isn’t needed. The Kershaw Injection 3.5 is another knife without any jimping and it’s not needed. The Rift has solid liners. Well, the knife weighs under 5ozs and carries incredibly well. The solid liners do make the knife sturdier. Some complain about the G10 being too rough. Please, not in my case. Others don’t like the pinky catch at the end of the handle. For my large hands, it works great. It’s comfortable and secure in all grips. Having a secure place for your pinky and ring fingers is very important when making cuts (especially thrust/pushing type). The standard 950 Rift comes with 154CM. Yeah, for the price etc., S30V would be nice but 154CM is still a decent steel. I’ve also found it very easy to sharpen. So, with that being said, I would try and handle one before buying. For me, the 950 Rift is an excellent knife. It’s by far the smoothest Axis lock I’ve ever handled. I have two Rifts. Both have perfectly centered blades and lock up tight. It has a great blade to handle ratio. The 3.7″ blade just disappears in my pocket. Not exactly like a Dragonfly but you get the idea. The reverse tanto blade is beautiful and slices really, really well. The G10 handles not only work well but are very attractive. The Rift just oozes quality. This is one tough knife. A knife magazine put the 950 Rift and some Cold Steel knives through torturous testing. The 950 came out unscathed. I wish more people would look into the 950 Rift. Thanks for reading and letting me comment Dan. As always, thanks for stopping by and taking the time out to leave a detailed comment. Comments like this help improve the website, as it gives the reader a number of perspectives. As for the Rift – I think it’s a great work knife. It’s not something I would regularly EDC at this point in my “knife collecting career”, because it’s large and pretty heavy. But if you can get past that then I agree that it’s just a workhorse of a blade and has a lot going for it. I had my heart set on the rift. But once i got it in my hands the scales left me wanting more. To me it was just to slick. Its a beautiful knife but I ended up going with the Contego and absolutely love it!! The scales are very aggressively textured. When grab it you know its not going anywhere. The contego is a large knife but im 6’4″ and wear a XXL glove so its size doesnt bother me a bit. Thank you for your reviews. I often check them out to get insight on knives that interest me. Just got a coated half serrated rift Osborne for Father’s Day . I own a benchmade resistor and bedlum, a syderco manix and a cold steel recon . By far the osborne is my favorite . Beauty and the beast in one lightweight package. Hard to beat. Way to go Benchmade. D Rod, Congratulations on the great gift. The Rift continues to be an excellent knife through the years. I hope you enjoy yours.